Why Service At LeBrun Toyota? With your on-the-go schedule, making time for Toyota repairs and maintenance can seem difficult. At LeBrun Toyota, we make life easy for you by employing certified Toyota service technicians who live and breathe servicing all Toyota models. Schedule a Toyota service appointment online or stop in at our Toyota dealership in Canandaigua, NY. As members of the community ourselves, we want to see you drive your Toyota for many years and miles to come. From routine Toyota oil changes to transmission repairs and brake service, we’ll service your vehicle proficiently to make sure that you can carry on with your day as planned. In need of a new battery? We sell OEM Toyota batteries and can install them ourselves. 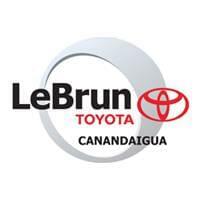 Plus, thanks to the LeBrun Toyota tire center, you’ll be able to traverse New York highways and byways safely and efficiently. Schedule a tire installation appointment or visit us for the expert Toyota repairs and maintenance you deserve.